Sri Lakshmi Astakam, Plays a very vital role in everones life. Life will become successfull by listening, by reading, by chanting. Which was sung the Great 5 elements Master - INDRA. Uvacha means said like this..
Indra speaks: I offer my worship to Maha Lakshmi, who symbolizes the great illusion and who is worshipped by all Devas. I worhip Maha Lakshmi who resides in Sri Peetam and who carries Sanku(Conch), Chakram(Disk) and Gadha(Club) in her hand. Indra speaks: I offer worship to the one who has Garuda bird as her vehicle and who was feared by even Demon "Kola". I worship Maha Lakshmi who destroys all sadness. Indra speaks: I offer worship to the one who is all knowing, giver of all boons, remover of all dangerous enemies. I worship Maha Lakshmi who is remover of all afflictions. Indra speaks: Maha Lakshmi confers great powers, desires, good intellect, enjoyment and Liberation (heaven). 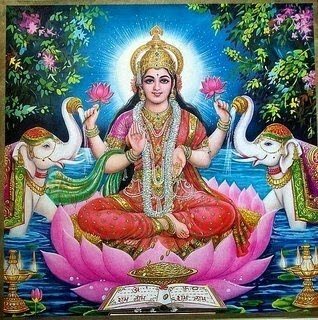 I worship Maha Lakshmi who is the personification of all mantras and who is ever shining and radiant. Indra speaks: Maha Lakshmi is the one who is without beginning or end. She is the primordial energy and Maheswari. I worship Maha Lakshmi who was created out of yoga and who sustains yoga sakthi. Indra Uvacha: Sthoola Sookshma Maharowdhre Mahasakthi Mahodhare Maha Pape Hare Devi Maha Lakshmi Namosthuthe Indra speaks: Maha Lakshmi represents both the gross and the subtle manifestations of life. She is very scary to the bad. She is the great energy. I worship Maha Lakshmi who destroys the greatest sins. Indra speaks: Wearing white clothes Devi Maha Lakshmi is adorned completely with jewels. I worship Maha Lakshmi who is the omnipresent Devine Mother. Palasruthi: Maha Lakshmi Ashtakam Stotram Ya: patheth Bhakthiman Naraha Sarva Siddhi Mavapnothi Rajyam Prapnothi Sarvadha Yeka Kalam Pathem Nithyam Maha Papa Vinasanam Dwi Kalam Ya: Pathen Nithyam Dhana Dhanya Samanvithaha Thri kalam Ya:Pathen Nithyam Maha Shathru Vinasanam Maha Lakshmir Baven Nithyam Prasanna Varadha Subha Benefits of Chanting this Sloka: The one who chants the above sloka with devotion will get all desires fulfilled and will inherit great land. nice post! can you please tell when to chant mahalakshmi stotram during Diwali or Dussehra? Chanting should start by 3 AM everyday in the Bramhi Muhuratha (Time).